The Toy Story pizza place Pizza Planet is opening in Disneyland and it sounds amazing. As of April, Redd Rockett’s Pizza Port in Disneyland, Anaheim, will become Alien’s Pizza Planet – A Better Place. While it’s set to be a temporary re-theme of the restaurant, it could become permanent after it opens alongside the PIXAR Fest festivities on April 13 according to WDW News Today. It is expected to be heavily-themed on the Pizza Planet restaurant from the Toy Story film series. The ‘A Better Place’ tagline is based on where the Little Green Men think they are going after they are chosen by The Claw in the original Toy Story film. The overhaul is very similar to when Pinocchio Village Haus ‘temporarily’ became Red Rose Taverne, which just so happens to be going strong well over a year later and there are no plans to restore the Pinocchio place. Toy Story Land at Disney is looking incredible, with the park updating future guests on what to expect. The park’s buildings have been designed to look like ordinary objects, making guests feel as though they’ve been shrunk to toy size as they venture through the park. Make no mistake, this is one wacky attraction… and fun for the entire family! 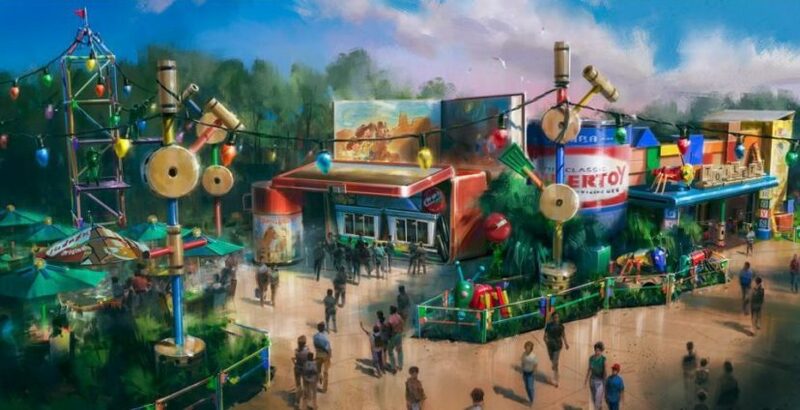 Ever since Bob Chapek, Walt Disney Parks & Resorts Chairman, confirmed Toy Story Land was in the works at the D23 Expo 2017, fans have been eagerly waiting for an opening date… which has now been confirmed as June 30! Get the date in the diary and those flights booked! How amazing does it sound?